Home / News & Press / Calling All Young Architects – Beer, Brats, and Bumgardner! 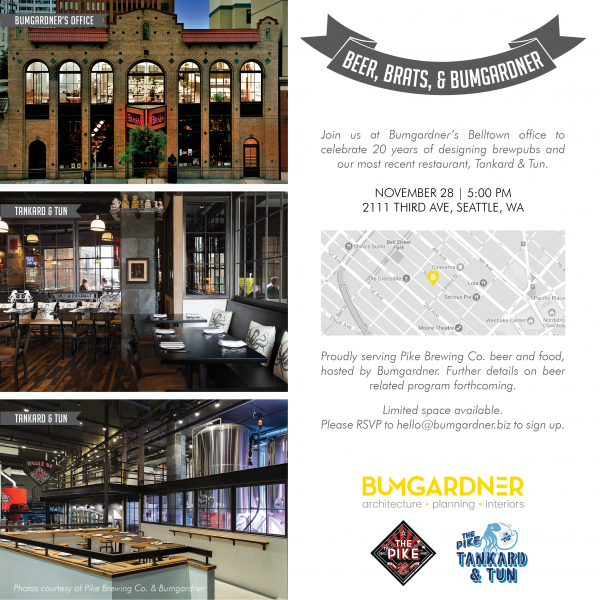 Bumgardner invites young architects and designers to join us in celebrating 20 years of designing brewpubs! Come learn about our most recent restaurant, Tankard & Tun while enjoying beer and brats from the Pike Brewing Co. Please see the invitation below for event details, and remember to RSVP to hello@bumgardner.biz with your contact information to ensure your place at the event.